Give the gift of Pottery Barn Canada gift cards today. Pottery Barn home furnishings are exceptional in comfort, style, quality, and value. Our in-house designers draw inspiration from around the world to create an exclusive collection of furniture and accessories for every space in your home – inside and out. Our Wedding + Gift Registry makes choosing the perfect gift easy, and through our Design Services, we offer complimentary decorating consultation in our stores, in your home or over the phone. For a store near you or to request a catalog, visit potterybarn.com or call 1.800.922.5507. 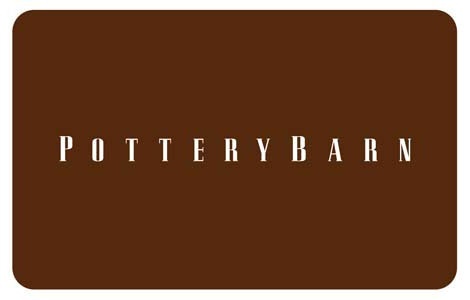 Purchase Pottery Barn Canada gift cards from National Gift Card Canada below! This card may be used for making purchases at Pottery Barn®, pottery barn kids®, west elm®, and Williams-Sonoma® stores in Canada only. It may not be redeemed for cash or applied as payment to any account, unless required by law. Pottery Barn does not accept responsibility for cards lost, damaged or stolen, or any unauthorized use of cards. Unauthorized resale prohibited. Acceptance of this card constitutes acceptance of these terms and conditions. Williams-Sonoma, Inc. reserves the right to change these terms and conditions at any time. For balance inquiry or store locations, call 1-800-846-9713.